Have you been struggling to create a writing career? Struggling for years to finish that novel, then finding that agents aren’t interested, or even try to take YOUR money to market your book? Does that sound familiar? –that your past failures are NOT your fault–you have been misled! —-you can thumb your nose at predatory agents and vanity publishers! Wouldn’t you love that? I’m here to offer you something different, a NEW OPPORTUNITY unlike anything else you’ve ever tried. And if you give me a DOLLAR to try it…I’ll give you a present worth FIFTY dollars just for trusting me! You’d give a dollar to get fifty dollars, right? I’m Steven Barnes, and I wanted to tell you how I changed my life forever…and how you can too. When I was a kid, I wanted to be a writer more than anything in the world. I’d rather have failed as a writer than SUCCEEDED at anything else–I wanted it that badly. Have you ever had a dream like that? But I’d never met a writer. No one I knew knew one. My mother was terrified I would fail, and actually burned my stories. Teachers mocked me, and bullies beat me up just for being a lonely, nerdy, sensitive, creative kid. I was told `black people don’t write.’ But I was too stupid to quit, to know when I was beat, and bulled my way through by hook or crook, struggling with every fear and doubt imaginable. But I was too stupid to quit, to know when I was beat, and bulled my way through by hook or crook, struggling with every fear and doubt imaginable. I sought role models, read hundreds of books, attended every lecture I could, and wrote and wrote and wrote, even though sometimes the rejections were so painful I curled up on the floor and cried. But somehow, I kept moving forward. I managed to put together a clumsy but effective collection of techniques that allowed me to limp from failure to failure until…I began to publish. And then make serious money. And then actually learn enough that I was asked by UCLA to teach others. Yeah, I had “Impostor Syndrome” and couldn’t believe I had anything to say. But I figured you could “fake it ’til you make it” and went ahead. Then one day, teaching at UCLA, I found something totally different. I ASKED A STUDENT TO IMAGINE THAT HE WAS A CHARACTER IN A STORY HE WAS WRITING. THAT AT THE END OF THAT STORY, THE CHARACTER GOT EVERYTHING IN THE WORLD HE WANTED. GIVEN THAT…WHAT WOULD HE DO NEXT? Astonishingly (after the steam stopped coming out of his ears) he began to come up with all of his own answers. And then…so did everyone else in the class. Take a moment and try this right now. Really, TRY THIS. Why? Because STORYTELLING is the most powerful problem-solving technique human beings have ever created. As soon as you think of yourself as the hero of a story, all the the trials, tribulations and efforts are all just part of the process of WINNING. Cool, huh? This simple strategy changed my life. 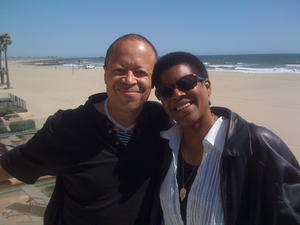 Applying it in all three arenas of my life (Body, Mind, and Spirit) it led to earning THREE black belts, becoming a NY Times bestselling, award-winning science fiction writer, and marrying my Soul Mate, American Book Award winning novelist Tananarive Due. The keys to the kingdom, right in front of all of us all the time! I’ve spent the last thirty years refining this insight, teaching it, healing students and clients so that they can achieve the same success…and T and I have finally created the LIFEWRITING PREMIUM program, bringing the most powerful mental and emotional strategies in the world to every aspect of your writing and your life! Couldn’t you use a little of that magic? If you are a writer, reader, film-maker, film-lover, teacher, or leader of any kind, LIFEWRITING IS FOR YOU. And LIFEWRITING PREMIUM is PERFECT for you if you are a writer or artist. And we’re so confident in our system that we’ll let you try it for the first month for ONE DOLLAR. Then, after 30 days, if you don’t agree that LIFEWRITING is worth far more than the mere $29 a month, just cancel and keep all the goodies you’ve gotten! Membership in the LIFEWRITING PREMIUM program, where you will receive weekly tips, lessons, videos, and audios to support you! The FULL ANCIENT CHILD audio program. Quite possibly the single most important tool in the entire LIFEWRITING toolbox, your creativity UNLEASHED, normally 49.95, yours FREE just for trying PREMIUM! The EYE OF REVELATION, the complete “FIVE TIBETANS” body-mind program. You can easily pay 29.95 for this book and information…again, yours FREE. Membership in our social media group, where you can ask any questions you want about any aspect of the process, find writing partners, share your work and resources, and so much more! Did I say fifty dollars? Math was never my subject. Oops…it’s almost EIGHTY dollars in value, just for trusting me with ONE DOLLAR. That’s the bargain of the year, right? This is LIFEWRITING PREMIUM, the resource center I would have given ANYTHING to find when I was younger, designed to take YOU to your first published novel…and beyond! THIS IS NOT “MORE STUFF”. IT IS A TOTALLY UNIQUE APPROACH TO WRITING, connecting the inner and outer worlds of the artist like never before, a combination of almost a CENTURY of combined experience in writing, teaching, martial arts, yoga, hypnosis, NLP, and more, all simplified into a step-by-step process. This is a new opportunity for you, to not only change your life, but change the world. Close your eyes for just a moment. Imagine that you are the HERO in the adventure of your lifetime, and at the end of that story, you got EVERYTHING YOU WANTED. What would you do next? What would you do NOW? If you’re like me, there is only one answer: risk ONE MEASLEY DOLLAR to get EIGHTY DOLLARS worth of gifts…and switch to a whole new way of living. If you are unhappy for absolutely ANY reason at all you will get a full refund.